Who else can say they have a patio table with beer/wine cooler built in! Guest will be amazed to know that you did it yourself!! Casual but organized, this pantry makes inventive use of flea market finds to boost its storage. Key to a pantry that stores its stuff well are labels, and many flea market finds have tags or handles with built-in space for marking. Make easy labels with pretty patterned paper, cut to size the opening and handwritten. Or, print out words of your choice on colored paper. Try to add function to every nook and cranny in your flea market pantry. Even a very small stretch of wall can be space enough for a few hooks, perfect for holding aprons and market bags. See-through containers are good options for kitchen pantries: They help all family members easily find what they need and help you know when you need more supplies. While some storage works better with lids, other items can be open at the top to enable easy access to oft-used items. Shopping and paper bags may be used frequently, and an old copper bucket is tall enough to hold varying height items but slender enough to fit into a modestly sized space in the pantry. Under-shelf baskets are a great way to organize small, compact things. A family organizing station offers loads of storage-focused function on a pantry wall that would otherwise go unused. Here, cork combines with chalkboard for meal prep, recipe ideas, and other reminders. If you’re storing fresh food items in your pantry, your storage items may need a few extra features. Potatoes and onions, for example, require air circulation to stay fresh; this punched and patterned metal bucket works perfectly. Always make sure the containers you are storing food in are food-safe. Why settle for boring stock doors for your pantry when you can create an entry that wows? Make the pantry door a memorable design element in your kitchen by giving it a fun color. Looking at a bold blue or a sunny yellow door is sure to make you smile every time you cook. We’re always quick to tackle decorating projects in the adult spaces of our homes, but what about the kids? Don’t they deserve some design love as well? Give the kids something to color on and have all they're supplies not to far from them!! Brighten up your kitchen by taking an old dresser, new coat of paint, locking casters, cutting board top and adding hangers for things you use all the time. Wah-Lah! Rolling kitchen island! Add colorful rugs to those well worn stairs. Be sure to a non-slip rug pad underneath to keep them in place. How's this for a great outdoor seating idea?! Aren't those painted cement blocks wonderful? Flip wire shelves for cans in the pantry! One of the easiest DIY headboard ideas I've come across are shutters. You simply lean them against the wall. Another great idea are old window panes...If you use this idea make sure to completely remove all the glass panes! Don't want to end up in the ER from cracking your head on glass! You can also use a decorative screen as a headboard. Using an old door is another great look that's easy to accomplish! Build your own platform bed with recycled barnwood & and old door! Anchoring a DIY headboard is always the question. Here's a way to anchor it to a typical bed frame using some imagination. We Love new ideas! Have some? Send them our way! Perfect idea for those skinny in between kitchen spots! Paint the jar lid, add a knob....great little storage containers. Take out shelving and install slide out drawers- genius! Isn't this a great painted wall? Create your own quiet spot. One you feel you can hide from the world in! 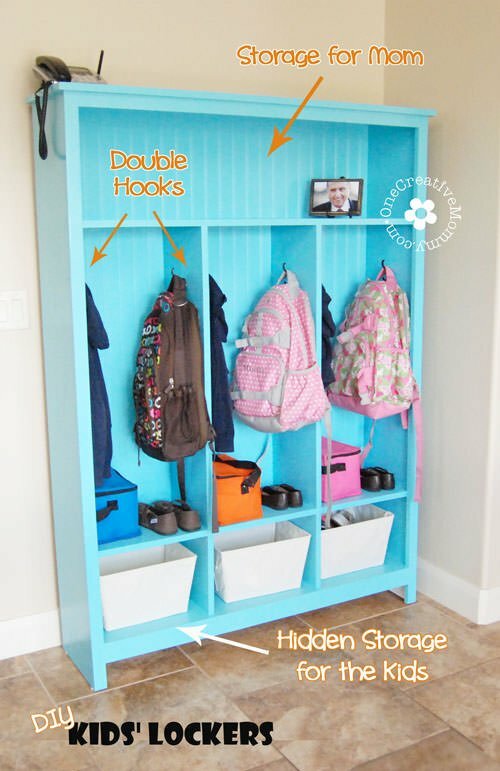 Love this idea of a way to divide a bedroom for two teens or pre-teens! Create your own unique, headboard! Crown molding makes some great shelves. Layering pictures adds another nice touch. Here's a simple way to create a canopy look when you don't have a canopy bed.